I could list off all the stats from Donovan McNabb’s ten-year tenure in Philadelphia: first in every relevant passing and quarterbacking category, five NFC Championship Game appearances, one Super Bowl appearance, six Pro Bowl Selections, five NFC East Division Titles and eight playoff appearances. However, I never write about sports because of the numbers; I don’t write about sports to use the numbers as an effective strategy of evaluating talent and managing a team, because, although I can manage many aspects of life, I never look to sports for management or organization, which is somewhat of a paradox in an institution which is based on various levels of organization. I have always looked to sports, as many do, for a release of my emotions, to let down the guard of daily priorities and deadlines in order to be taken away in the human emotion and narrative of the game. Like many use movies, I use sports as my escape, and at the same time as that strange vantage point in which to view the human condition. Now that the Eagles have traded Donovan McNabb to the Washington Redskins, it feels like a part of my own life has been traded away. It’s not as though my memories, good and bad, have been taken away forever, but at the same time, it’s an era that has ended; a certain sensation lost. This is mainly because there has not been another sports figure in my life that I have grown up so closely with or have been as “intimate” with in the ultimate sense of sports. As a basketball fan, I of course grew up with Michael Jordan however, he was a far more omnipresent sports deity than McNabb ever was. As a Philadelphia fan, I grew up in the Eric Lindros era, but he was too much of a primadonna and an underachiever to truly embrace. As a Philadelphia and basketball fan, I grew up in the Allen Iverson era. Iverson was a figure who I admired greatly for his athletic ability, his toughness, his desire to win and for his defiant attitude – although that attitude often worked to his own detriment. He was a figure that fit perfectly with the Philadelphia sensibility and left us with many memorable moments. However, I was far more invested in the NBA as a whole than in the Sixers themselves and traditionally, like most Philadelphians, I have always been an Eagles fan first and foremost. So, in 1999, a pitiful franchise drafted a black quarterback with a canon arm and unheard of agility with the second pick of the NFL Draft. 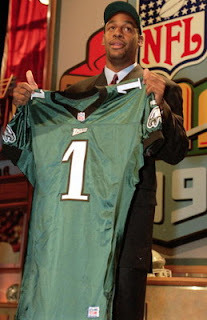 The crowd infamously booed at McNabb when he was introduced onstage, which signaled the beginning of the love/hate (mostly hate) relationship between Philadelphia and Donovan McNabb for the next ten years. I was fourteen years old when the Eagles drafted McNabb. I am now twenty-four years old. In McNabb’s time as quarterback, I have seen three different presidents, graduated high school, graduated college, seen Phish break up and reunite twice, lost my grandmother, fallen in love, lived in three different “cities” and had a world of other experiences that feel like they belong to a different life. In McNabb’s ten years as quarterback, he has been both savior and the ultimate goat; he has been a courageous opponent of racism and bad radio hosting (Rush Limbaugh); he has been the focus of a pro-sports soap opera (T.O. vs. McNabb); he’s been injured and been washed up; he’s made one of the best plays in NFL history; been to the Super Bowl; played on a broken ankle; and has at times been the most electrifying and exciting player in the entire league. He has gotten married and had kids, while I have been put on the precipice of finding my role in the world. He has been an integral part of my life – a focus of my adoration and scorn. Even though I have never met him and probably never will, he feels like her is a distant member of my family. I have never felt that way about a professional athlete and I don’t know when I will again. 1. 2001 NFC Championship Game (January 2002). Eagles vs. Rams at the Edward Jones Dome in St. Louis. The Rams are one of the best teams in the league. They are known as “The Greatest Show on Turf” with Marshall Faulk, Kurt Warner, Isaac Bruce and Tory Holt lining up on offense. I was in a local bar at my town watching the game with the father of one of my sister’s childhood friends. He was a Philadelphia transplant as well and faced the same amount of adversity as I did sticking to our favorite football team deep in Jets/Giants territory. The Rams were heavily favored in the game, as the Eagles had made an impressive run beating the Giants and Bears to get to the NFC Championship Game. At the end of the first half, the Eagles were actually beating the Rams 17-14. I was 16 at the time and had never experienced this kind of success or excitement as an Eagles fan. My lasting memory as a fan had been watching the Eagles lose to the Cowboys in the 1992 Divisional Game and crying like a baby (well that and the infamous 4th and 1 stand against the Cowboys in 1995). I looked to my sister’s friend’s father and told him that I thought the Birds had the game. This man, being a far more experienced Eagles fan and a drinker than I, told me to hold tight and bought me what was a very welcome underage beer. I sipped on that beer and a few others as McNabb came out cold and inaccurate in the second half and the Rams took the lead going into the fourth quarter. I felt the same feeling in my stomach that had wrenched me apart back in 1992. 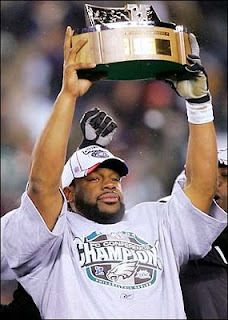 However, McNabb came alive in the fourth quarter and put the Eagles up before the Rams came back to take the lead. I gripped the pint glass in horror as the Rams regained possession due to the Eagles continued offensive problems. But the Eagles defense came through and stopped the Rams, giving the Eagles the ball with 2:20 left and one timeout. McNabb and the Eagles took the ball into Rams territory, but McNabb threw an interception and that was the game. I looked at my sister’s friends’ father and he shot me a knowing grin. That same feeling from 1992 exploded in my stomach and he slid me another pint as I watched Donovan, helmet off, shaking his head as the confetti fell in the Edward Jones Dome. Something about his look told me they would be back the next year. Two weeks later, Tom Brady became a household name. 2. 2003 Home Opener. Eagles vs. Buccaneers. The Eagles had blown the NFC Championship Game against the Buccaneers the year before and the Bucs had gone on to win the Super Bowl. I thought the game was a fluke and heading into the 2003 season it looked like the Eagles were vastly improved and were the favorites along with the Patriots to win the Super Bowl. However, they came out flat in the first game of the season against the Buccaneers. They looked uninspired, as though they had forgotten how to play football. I was a freshman at college and I remember frightening the crap out of my roommate when, after a terrible Donovan pass, I ripped my phone out of the wall and hurled it across the room and into the wall, letting it smash into pieces all over the floor. According to my roommate, I then muttered, “I don’t want to live anymore.” A classic McNabb era moment. As I look back on all of these McNabb memories, and even think of some of the more successful ones like the Broken Ankle Game or the Scramble Throw Game, I feel as though maybe these three stories don’t capture the feeling that I am trying to describe. Instead, I am reminded of the 2003 NFC Championship Game (January 2004). Eagles vs. Panthers in Philadelphia. The Eagles are heavily favored to get over the hump and play the Patriots in the Super Bowl. The only problem is, they don’t show up. They play listlessly against the Panthers and again look like they have forgotten how to play football. I am watching the game in my basement, throwing anything that is not nailed down. My family is upstairs and, after having bought me snacks to watch the game during my first winter break home from college, are cowering in fear. As the Eagles blew another chance to take control of the game, I hurled the remote at the wall and screamed, “This wasn’t supposed to happen!” I felt that same explosion in my stomach and I felt as though I were going to cry all over again – just like 1992. However, I didn’t. But looking back on that moment now, it seems to sum up everything to me. It’s just me, alone, with McNabb and the Eagles and things just aren’t going the way they should be going. During those peak years of McNabb’s run 2001-2004, every time he and the Eagles failed, it just seemed wrong, like it wasn’t supposed to happen. They had tremendous seasons each year and he was so exciting and so multitalented and such a “nice” guy that it seemed like he was going to be the one to put Eagles fans out of their misery. However, he never could and that wasn’t supposed to happen. So, now, after ten years with the Eagles, he has been traded to division rival Washington. I won’t hold it against the Eagles for trading him and hopefully I will get over seeing him in a Redskins uniform, although that may never actually happen. Something tells me it will always be strange to me, because he shouldn’t have been traded to the Redskins. He should have remained an Eagle until the end of his career, because we are the only city that deserved him. Only Philadelphia deserves an athlete who was talented and successful but never appreciated. 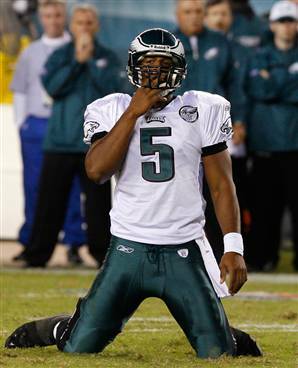 Yeah, McNabb did choke and choke often, but he was booed on the first day. He was constantly put on the cross when no Philadelphia fan would do the same to themselves for being a bad fan. McNabb wasn’t supposed to go to Washington – he was supposed to stay in Philly to keep the fans miserable.